You all know that my favorite feature to play up around the holiday and winter season is my lips. I absolutely love the deep vampy shades that are in style around this time of year, as well as a classic and festive red. The only downside is that I get super paranoid about how my lipstick is wearing throughout the day. Since the shades are so bold, any smudging or fading can completely ruin the look. 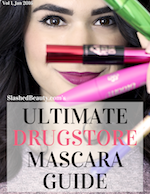 A couple of weeks ago I heard about a product called No, My Lips are Sealed from Know Cosmetics at Sephora. I asked you all on my Snapchat (username: slashedbeauty if you’re not following already) if it was something you’d be interested in hearing about and I got a resounding YES. It seems like I’m not the only one who has #lipstickprobs this time of year. 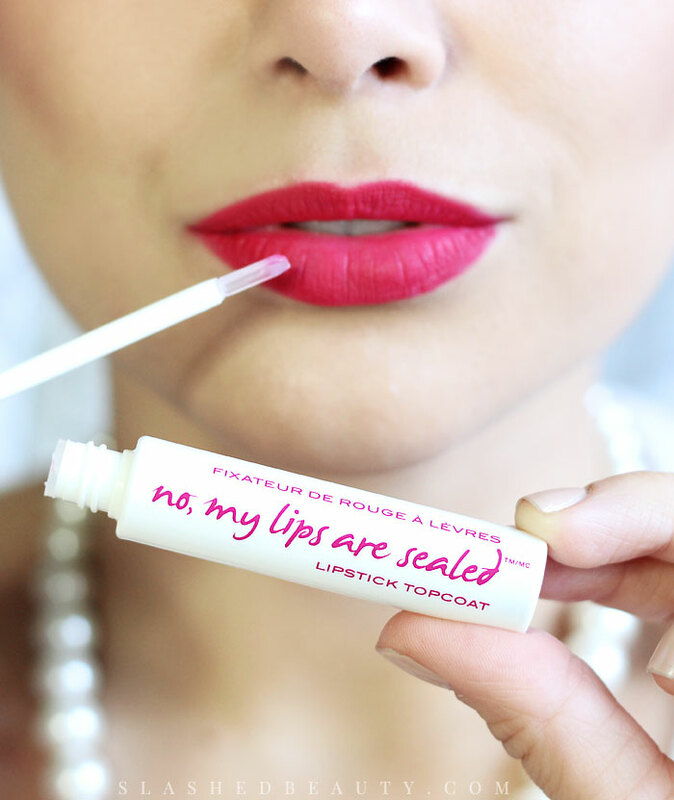 No, My Lips are Sealed is a transparent gel topcoat that you can use with literally any lipstick you already own. It helps reduce lipstick fading, smudging and transferring, locking your lipstick in place all day and night for whatever the holidays may bring— from kisses to cocoa! You start out by applying whatever lipstick you’re in the mood to wear, and blot lightly with a tissue. Then, after shaking the lipstick topcoat, you can use the silicone wand to distribute the gel over your lips. I find it to actually make my lipstick appear smoother and slightly mattifies it. After letting the topcoat dry for a few minutes, you can test it out by kissing the back of your hand. You know you’re ready to go when you don’t see any color transferring. Okay, I admit, there wasn’t any tea or cocoa in that mug but I really did press my lips on the cup and there was no lipstick mark! Same with the glass— that was literally 5 minutes after putting on the topcoat. Throughout the day, my lipstick was looking as fresh as it did when I first applied. Even after eating, I only saw fading on the innermost part of my lips. That’s a huge difference as I normally am only left with a ring around my mouth like a terribly executed lip liner. Also, I drink a ton of water throughout the day (gotta stay hydrated this time of year, am I right?) and while the rim of my cup usually accumulates a ton of lipstick all the way around, it was still completely clean by the end of the day. 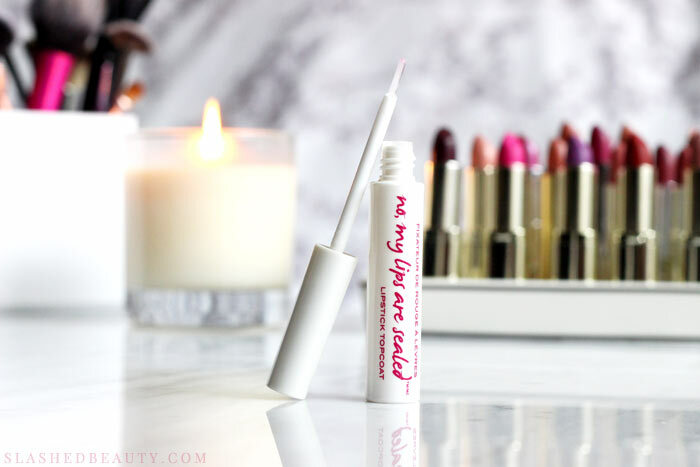 I will say that the topcoat slightly alters the lipstick finish to be more matte and less glossy, which helps keep it from transferring, but no fear— it’s actually hydrating and never sticky, so you don’t have to worry about comfort. It is also completely colorless and tasteless. 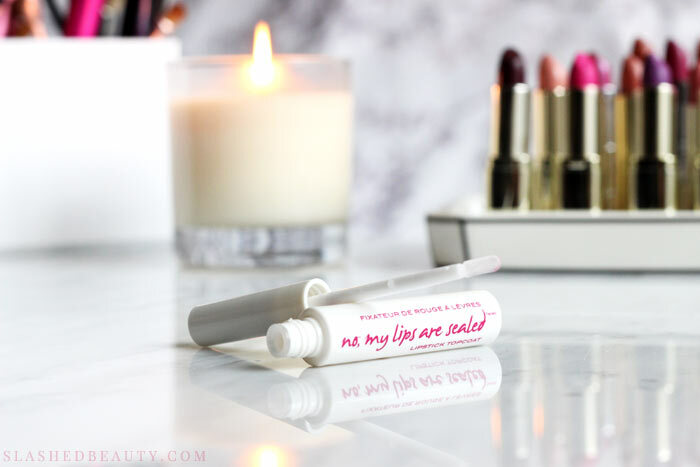 Bottom line is, for the holidays and throughout the new year, No, My Lips are Sealed is going to be a staple in my collection when I need bold lips to last all day and night. The first thing I thought when I realized that it actually worked was that I need to have this by my side during my wedding! No, My Lips Are Sealed is available from Know Cosmetics at Sephora online for only $25. I 100% would purchase this myself and agree that it’s worth the money, as you can mix and match with any lipstick you already own. You also don’t need a lot of the gel to cover your lips, so one tube will go a long way. Tell me in the comments: what’s your favorite bold shade to wear during the holidays? I couldn’t wait to get my hands on this.. am disappointed coz it didn’t work for me.. I used my regular mac lipstick and applied it on top of it.. it sorta dried but it kept transferring.. didn’t seal at all 🙁 how long am I supposed to wait for it to dry?? I used moisturizing lipstick.. is that the issue? Hmm possibly, though it’s supposed to work on all types of lipstick finishes and I haven’t had a problem. You probably just have to wait for it to dry longer if it’s a moisturizing lipstick. I would suggest trying again but blotting your lipstick before you use this– so that way it dries quicker and it’s not just wet on top of wet, does that make sense? Hope it works out! I’ve been using this for every special occasion and haven’t been disappointed yet! This actually doesn’t dry out my lips and I’m super sensitive to that!!! The only “lip seal” I’ve tried before is Lipcote, but it doesn’t last so long. This is a great discovery! I need one in my life. Oh my gosh!! 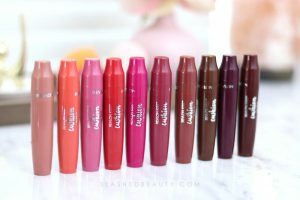 !This is such a cool product!My only concern would be the wand getting black or something from all the different colors.But besides that,this is something I want to try,I’m tired of my poor water cup looking like a lipstick graveyard! that is such a nice video demo, I love it! Years ago I bought something that sounds like this but it practically sucked my lips together. So nice to know that a great product is now available. Wow, this looks so awesome! I love that it won’t make my lips too dry. Thanks for sharing this brand! SERIOUSLY. NEED. Like, what?! This is amazing! That is very interesting. I used to use a product called My Lips Are Sealed and it has disappeared. I wonder if this is it in a new iteration? I will definitely check it out! Heck yes! I literally DESPISE when my lipstick gets on things (especially when I eat, it’s a giant pet peeve). I’ve never heard of this stuff but I need it! OK, I MUST have this!!! !